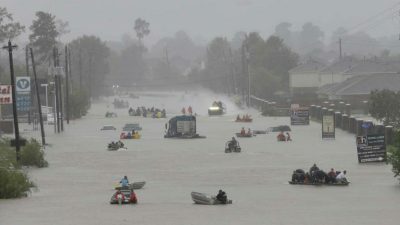 The Party for Socialism and Liberation expresses our condolences and solidarity to those who have suffered the loss of loved ones, been injured, or lost their homes and other vital possessions due to the ravages of Hurricane Harvey. Twelve years to the day after Hurricane Katrina destroyed New Orleans and much of the Gulf coast, millions in southeast Texas are suffering the devastating impact of another huge storm. An unknown number of people are dead or missing, and tens or hundreds of thousands are desperately seeking refuge as the flood waters rise to historic levels. Thousands of heroic volunteers of all nationalities have joined in efforts to rescue thousands trapped on rooftops and nursing homes. The immediate cause of the crisis is record rainfall, in some places over 50 inches in just a few days. But like Katrina and virtually every other major natural disaster, the crisis has been worsened by an abject lack of government readiness. Hurricane Harvey has exposed government at every level as being woefully unprepared to meet the needs of the people. While in ordinary times this reality is somewhat concealed, in times of catastrophe it is fully visible and undeniable. The fundamental cause of the repeated pattern of government failure is that under the existing capitalist system governments are organized not to serve the interests of the people but instead those of the corporate owners and the super-rich. “Hurricane Tips from Cuba,” New York Times, July 29, 2013. Houston, the fast-growing and fourth largest city in the U.S. with a metro population of 6.6 million , is on low, flat land and vulnerable to flooding. The current disaster is the latest and worst of four major flooding episodes in just the past nine years. A major cause is that the city has no zoning laws, so development is largely unplanned. So, too, is emergency preparedness. At the same time, the governor of Texas, a virulent right-winger, Greg Abbott, called for Houston residents to evacuate, but offered no assistance or plan for evacuees. This, too, was reminiscent of Katrina, when those who had the funds escaped New Orleans in chaos, on jammed roads, forced to pay sky-high rates for hotel rooms. Those without resources were left behind, leading to the deaths of more than 1,800 people, overwhelmingly poor and African American, when the levees broke. Houston is home to many oil refineries, all of which were shut down in advance of the storm, in some cases releasing toxic pollutants into flood waters and the air, affecting nearby communities which are disproportionately Latino and African American. One chemicals plant in the northeast edge of Houston, Arkema, is in critical danger of massive explosion because the electrical cooling systems and back-up generators have failed. Even before the shutdown, some oil executives were talking of gas price hikes when they re-start and gas stocks rose 7%. As always, the corporate profiteers have only one real objective. Nearly 600,000 undocumented workers live in Houston. While the governor was telling Houstonians to evacuate, the Immigration and Customs Enforcement (ICE) announced that they were keeping in place internal checkpoints on major highways. Undocumented workers were thus forced to choose between the flood and a potential threat of deportation. More than 30% of Harris Country, 444 square miles, is under water and hundreds of thousands of residences have suffered water damage that will often require tens of thousands of dollars each in repair costs – if they can be repaired. While Trump staged a public relations trip to “assess” the damage in Texas, his administration is calling for slashing the federal flood insurance budget and flood insurance subsidies to homeowners who live in areas highly vulnerable to floods. If enacted, this would raise annual insurance costs to astronomical levels, from present monthly premiums of $100-200 to as much as $2,400. Presently, the homeowners insurance covers wind damage, but not water damage. Many Houstonians have the former, few have the latter. The danger in southeast Texas remain acute, with rain still falling, rivers and bayous still rising and old reservoirs and levees in danger of failing. But even if the rain were to immediately stop and the rivers recede, the long-term crisis would only be starting. Many months and perhaps more of reconstruction are ahead. The Party for Socialism and Liberation salutes all those on the ground in Texas who are engaged in the recovery effort, and we are joining in that effort. At the same time, what is needed more than ever is a mass people’s movement that demands the federal and state governments provide the assistance and funds – not crushing loans – for rebuilding what has been destroyed, in a long-term sustainable fashion. We need a new system of political governance. Under capitalism society’s plentiful resources are marshaled by the government to streamline profit-making by bankers, real estate developers and corporations rather than to protect and defend all the people and the environment. The people’s needs must come first!